- Des and Daphne clean up after the ransacking of Des's house. - Des turns up at Eileen's house to find George in his underpants. Eileen hastily explains to Des what happened with the spilt wine. Des strings her along and pretends not to believe her. Evenutally Des starts to giggle, but Eileen is not amused. She says she'll never forgive Des for this. George makes light of it but Eileen drags Des off by his ear (literally) and gives him another dressing down. 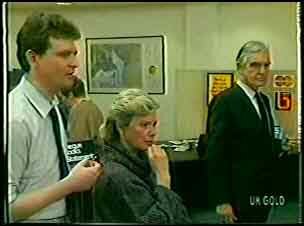 George offers Des a glass of wine but Eileen escorts Des to door, slamming it in his face. When Des has gone, Eileen busies herself drying off George's trousers. She's obviously very upset though. 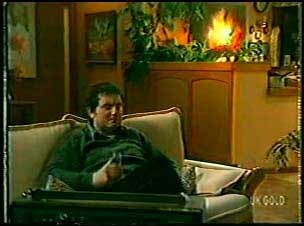 Max is watching TV while Danny tries to make steak and chips. The steak isn't defrosted, so Shane suggests running them under the hot tap. Apparently Des isn't upset that Max shouted at Eileen and said she was an "interfering fat cow" anyway(!) Danny decides to go and ask Helen's advice about the steaks. 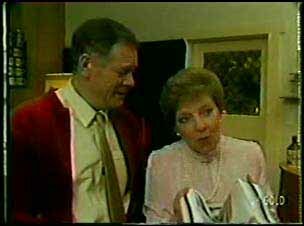 Scott and Helen are sorting out the wedding presents when Danny arrives. He shows her the steaks and Helen takes him into the kitchen - she's got some in the fridge that is already thawed. Max is watching TV, but Danny has left the pan on. It bursts into flames. Luckily Max notices and douses the flames with a tea-towel. Helen is explaining to Danny about how to thaw meat out. He heads off back home. Shane is cleaning up the frying pan - no lasting harm has been done. 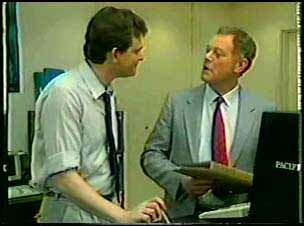 Max tells Danny off for leaving oil on the stove unattended. Shane says he'll get some takeaway for tonight and they can have the steaks tomorrow. Danny puts them in the fridge. Helen and Scott are looking at some of Helen's paintings. Des comes round looking for his spare set of keys - he's lost them and thinks he might have dropped them at the wedding. He admires Helen's paintings and Des says it would be great if Helen could exhibit them at the bank. Helen is surprised, but very pleased. Des tells Helen about George who is "Eileen's new heart-throb". George is telling Eileen that his whole life is work these days. They have been getting on very well. He stands up to leave since it's already 10.30pm and his trousers are already dry(!) At the door, he thanks Eileen for a good evening. They agree to see each other again. Then George goes to kiss her, but Eileen gives him her hand nervously and he kisses that instead. Des asks George how he's getting on with Eileen, saying George is a "quiet achiever"(!) Apparently Eileen has told George that she left her husband. Des asks what Eileen said, but just then Eileen comes in with Helen. 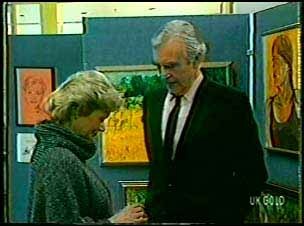 Helen has brought the paintings, so she shows them to Des while Eileen has a word with George. 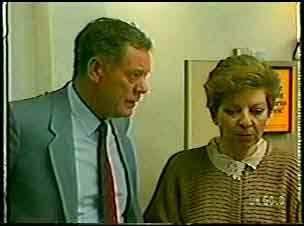 George tells Eileen that he inadvertantly mentioned Eileen's previous marriage to Des. 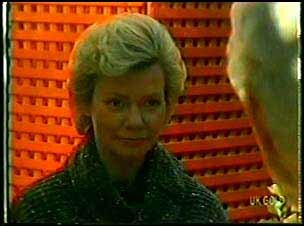 Just then, Des drags Eileen off and tells her not to lie to George about Des's father. He says she'd better be honest with George, and she'd better leave the Ramsays alone too. Helen and Des look at the hanging order of the paintings. Just then, a customer comes up and gives his opinion on the hanging order. 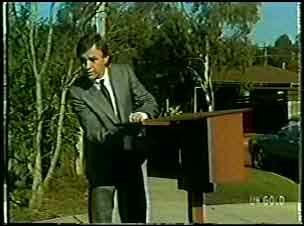 He introduces himself as Douglas Blake, an art advisor. He says Helen has an interesting style. Helen says she calls it "loose realism". 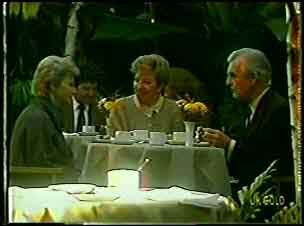 They talk about art and Douglas invites Helen to come to the Coffee Shop with him. Just then, Eileen comes up and Helen explains that they're about to go for coffee. Eileen invites herself along. The dodgy-looking man (presumably Terry's ex-husband) rips a photo of him and Terry down the middle. He goes to No.30 (where Terry and Paul are currently staying) and puts the photo into the letterbox. Then he lurks suspiciously. Scott comes out with some wedding presents and the dodgy-looking man approaches him. He helps him to carry the presents, saying he's just moved in locally. He takes the keys and goes ahead to "open the door for Scott". While Scott is struggling with the presents, he presses the key into a mould. Des is eating a cheeseburger when George comes over to speak to him. He asks Des that he should speak more nicely to his mother. Des says his relationship with his mother is his business. 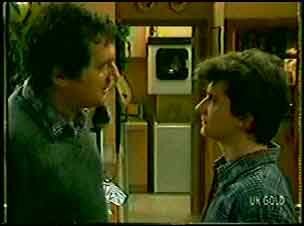 George tells Des to examine his conscience and that Des takes his father's side more than he realises. Des is flabbergasted! When Eileen has finally gone, Douglas tells Helen that he has a proposition for her.